YOUNGEST INDIE: My cult status keeps me alive. My cult status keeps me alive. I am looking forward to spring. I'm tired of being sick and everyone around me at work being sick. I'm dreaming of spring dates with a crush, wearing light weight frocks and pretty things. 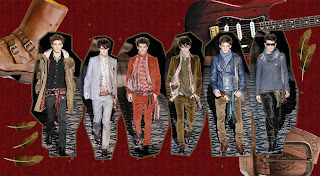 However, it IS men's fashion week in Milan, and when I saw some of the AW 08/09 collections online, I freaked out and got so excited. Because of my job, I try to check out every single designer, but there's no denying that I have my own personal taste which means I have my favorite designers. And this is when I realize why they are my favorites. Menswear is something I've always been interested in. My last job, I did mostly menswear, and I really liked it. Regardless, I always find myself in the men's section, just to look. Moschino is also a favorite of mine. (pronounced "mawskino") Ever since the late 90s I have been following them. They never disappoint, really, whether it's menswear or womenswear. Look at those shoes!!! Also, please note the vertical stripe pants. See my post about my obsession with them. Oh my... Look at this collection. I freaked out. It is Gucci's latest. I think Frida Giannini is doing an amazing job post-Tom Ford. I loved her resort collection, that was some major rockabilly going on. For fall, they say she listened to lots of Gogol Bordello and designed her visions of gypsy boys. Gypsy boys are so rock&roll, so hot, so perfect. 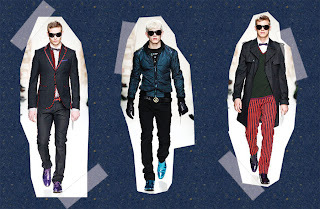 To see the whole collection, go visit men.style.com. Recognition. You better live it up.